We at Dead Rhetoric feel fortunate to watch progress from release to release in not only the veterans of metal, but also the new breed striving to bust into the scene. 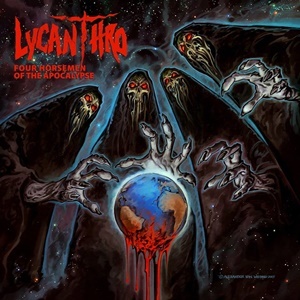 Canadian band Lycanthro released a self-titled EP last year that co-mingled power, traditional, and thrash aspects to their sound, establishing a presence which has been built upon for the follow-up Four Horsemen of the Apocalypse. The four-songs contain interesting twists, especially for those who enjoy the epic side of the genre as there’s 33-minutes of music to consume – so let’s delve into the material and see where the quartet sit in terms of establishing a quality career. The biggest improvement comes in the stronger delivery and knowledge of where to place emphasis for melodies from vocalist/guitarist James Delbridge. It’s clear when taking in songs like “Fog of War” and “Plague the Land/King of Decay” that he has a bit of Eric Adams under his belt, but prefers to keep things in the lower/middle registers and only use higher notes for special occasions. He even gains Canadian support from ex-Exciter singer Jacques Bélanger for the 13:45 closer “Pale Rider” – a number that explores a more expansive arrangement, shades of quiet introspection against power gallops, natural piano aspects, and a transition that makes you feel like you are going from Avantasia or Iron Maiden one minute, then Helloween or Metallica the next. Keyboards also appear in opener “Conquest” – used for texture support, while the main riff sequence has a bit of mid-tempo / “In My Darkest Hour” from Megadeth swagger, an ideal opener to get the audiences swinging and bouncing along. If improvement needs to be made at this point, it’s probably in the speedier lead breaks throughout. The main arrangements and part to part construction of the material has proper flow and forethought, where you sometimes feel that the shredding doesn’t always fit in the melodic power/thrash context of the individual songs. David Shute and James have the capabilities (check out some of the slower breaks during “Pale Rider”), it’s only a matter of time for the band to get all cylinders firing in the right direction. 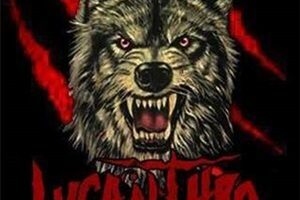 Lycanthro offer hope for the Ottawa metal scene – taking some classic influences and intertwining them into a potent, headbanging outfit. International attention and accolades aren’t far behind as these members grow.